Used by the nation's leading structural wiringinstallation training organizations. Preferred by major Telcos and Contractors. Fully redesigned with the Pro in mind! These comfortable, easy-to-use staplers are easy to load and won't crush cables. 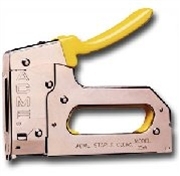 Only Acme staple guns feature high-visibility safety yellow "Sure-Grip" handles and integral hand-stop for maximum year-round comfort and safety. If it says Acme on it, you can be sure that each one comes with a limited lifetime warranty. 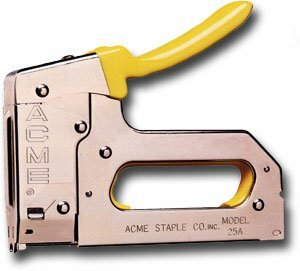 Our unique loading system makes Acme staple guns faster, safer, and more reliable than ever before. Low Cost, Fast, Safe & Crushfree Fastening of DSL and Coax Broadband Wires!